What is a gender role? It is the unsaid (and often screamed) expectation that society has for you about how you should or shouldn’t act depending on your gender. For little boys, it’s the idea that they should like playing with trucks and pretending to be Super Man. For little girls, it’s that they like to wear dresses and play with Easy-bake Ovens. Obviously there are problems with this way of thinking, mostly because it shoves all of us into pink or blue boxes. But the “other side” isn’t so shiny. Progressives say they want a world where gender roles don’t exist, where we make up our own social constructs for behavior in a way that each individual sees fit. But tailor-fit social norms are like man-made unicorns: no matter how much you want them to exist, they will always be merely horses with horns glued to their heads. But my view of gender roles isn’t defined by what society says. Actually, I’m pretty sure that I’d make enemies on both sides of the gender role fence. For me, gender roles are far more complicated and come with far greater expectations. You see, my gender role is based on the Bible and what it says about women. 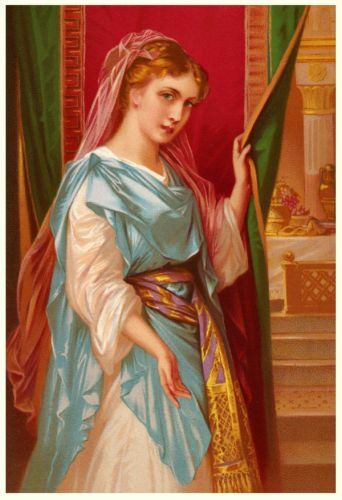 Queen Esther was one of the many wives of the King of Persia. Society expected – and demanded – that she be silent and only see the King when he asked to see her. But, after some crazy laws were enacted to kill all the jews in the area, she and her uncle concocted a plan to save their people. So Esther went against the social norm (and risked her own beheading) and sought the King’s presence without permission, ultimately saving her people. Rahab is my personal favorite. When Joshua sent spies into the city of Jericho, Rahab, a prostitute, hid them from the city guard by keeping them in her home under some flax bundles. She didn’t know the spies. And she wasn’t Jewish. But she knew they were going to do some seriously awesome things and she wanted to be on their God’s side. So she made them an offer they couldn’t refuse, and when they destroyed the city, Rahab and her family was saved. Deborah was a female prophetess back in the day and the only female judge – so kudos there. She also led a counterattack against the King of Canaan and won. If that’s not cool enough, she foretold the awesomeness of Jael, wife of Heber, who helped achieve the victory over the King by driving a tent-peg though the head of his military commander (think: Éowyn from the Lord of the Rings movies). That doesn’t sound prim and proper to me. Ruth got her M.R.S. degree and then her hubby dropped dead, leaving her to take care of her mother-in-law. So she got to work. She spent hours every day picking up scraps from the field to take care of her now broken family. That’s where she caught the eyes of hunky Boaz. But because of several technicalities he wouldn’t commit to a relationship, so Ruth forced him to declare his intentions by sleeping at his feet (it makes sense culturally, don’t worry). Then they got married and Ruth became the great great-grandmother of King David. So gals, don’t let that guy lead you on. 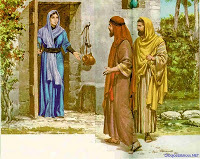 Mary and Martha were sisters and pretty close friends with Jesus since he and their brother Lazarus were bros. When Jesus came over to hang out one day, he actually told Martha to get out of the kitchen and stop working so hard. He told her to be more like Mary who was spending time with him in the living room instead of being Little Miss Housewife. Being the perfect hostess is valuable, but it isn’t the end-all-be-all. Chill out, ladies. Not only was Mary Magdalene not married (at least no husband is ever mentioned), but she was also possessed by seven demons. How’s that for an E-Harmony profile? But Jesus cast the demons out and welcomed her as one of his disciples. No one ever called her out for not having a husband. She got to do everything all the other disciples got to do. Plus, she was the first person to see Jesus after he resurrected – and was the one who told all the disciples about it. Her marital status wasn’t what defined her, but her discipleship with Christ was. She was the orignal “single lady” who became a major figure in the Christian church. These are just highlights of some of the amazing women in the Bible. Each of these women’s stories are rich and vast in their own right, and have plenty more important themes to glean that are beyond the subject of this post. But it is from these women that I have cultivated my view of “gender roles.” Mine are based not on what society tells me, but on what God tells me. And He says that I can be married or single, a stay-at-home mom or a working woman, the perfect housewife or a powerful business woman – so long as I do His will and live according to His plan. And that sounds pretty freeing to me. You should totally include Tamar, Judah’s daughter-in-law turned baby mama. Tamar was chosen by Judah for his oldest son Er (AKA – A total tool). Tamar was not Jewish. She was a Canaanite but chose to love the Hebrew God. So when Er withheld his sperm and thus her right to bare children, God killed him. Tamar followed custom and was married to son # 2. And guess what? God killed him, too. Judah was scared out of his mind and refused to give son #3 to Tamar, sending her back home a widow and without hope of a good life. So get this, Tamar knew that Hebrew custom said that if the sons were unable to perform their ‘duty’ then the duty fell to the father of the household, aka Judah. So she found out he was going to town one day and dressed up as a prostitute, seduced him, and conceives. Still completely ignorant of what just happened, Judah gives Tamar his staff as payment until he can get to an ATM. Pretty cray, right? But it doesn’t stop there. Instead of rubbing it into her face, Tamar goes home and waits… the town goes crazy and is like, Tamar is a hoe and was sleeping around! She has Judah come, shows him the staff, and he claims her as hid daughter and takes her to live with him (and never sleeps with her again). So Tamar fulfilled her right as a woman without shaming Judah. BOOM. Thanks for your perspective, Haley. I’m reading a new book right now that I think compliments what you’re talking about. It’s written by Dr. Tony Evans and his daughter, Chrystal Evans Hurst. I think it’s an outstanding book for all women. It’s called “Kingdom Woman: Embracing Your Purpose, Power, and Possibilities.” It was their desire in writing it to “challenge women to look higher than where you are to whose you are, and to be transformed by the truth of being a Kingdom Woman.” The book encourages women to set their eyes on Christ and to pursue what God has created them to be. It is true to that goal. I am thoroughly enjoying it and hope you will, too. I think it is in line with what you are saying. They have also posted some free devotional downloads that are great on their website: kingdomwomanbook.com. Hope it blesses you as it has me!